This repair kit contains enough parts to repair most two door sets. This kit will easily repair a 3/8 In. diameter hole system. It is best used on track systems with a width of 7/8 In. This by pass door bracket houses a 7/8 in. nylon roller. It features an adjustable top hung side mounted design. Fits Acme and similar doors that are 3/4 to 1-3/8 in. thick. Set of handed, top mounted wardrobe door roller assemblies that have an adjustable height feature. They are left & right assemblies with 7/8 inch. convex or round edged nylon rollers that hang in a track mounted above. They also work as corner brackets holding the sides and the top rail together. Used by Acme and Stanley door systems. This wardrobe door roller is constructed from nylon and comes affixed to a zinc plated steel bracket. It features an adjustable, top hung, side mounting design. Fits Cox and similar doors that are 3/4 to 1-3/8 in. thick. 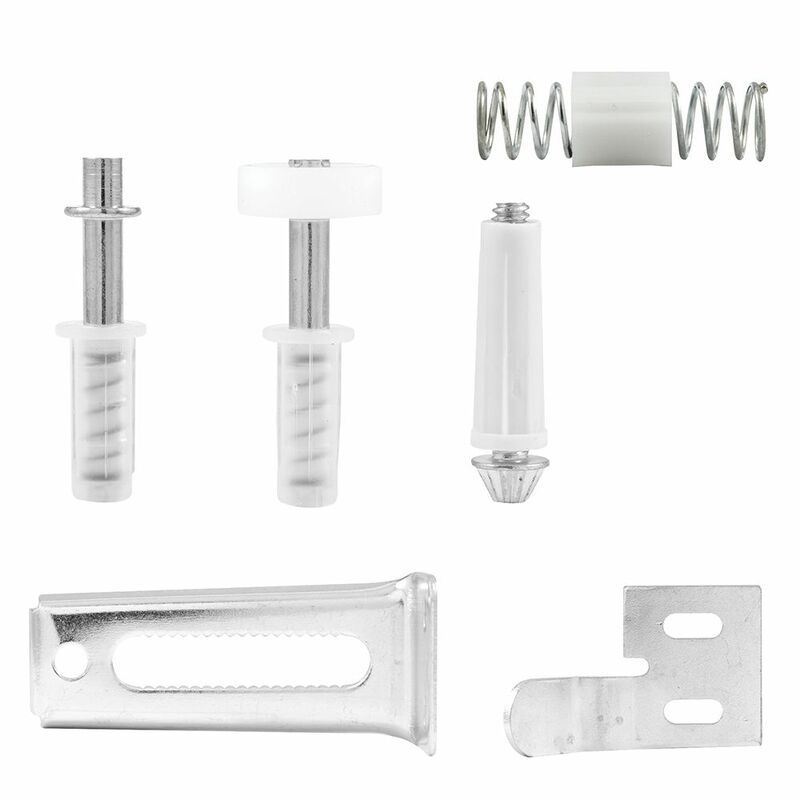 Repair Kit for 2 Bifold Doors This repair kit contains enough parts to repair most two door sets. This kit will easily repair a 3/8 In. diameter hole system. It is best used on track systems with a width of 7/8 In. Repair Kit for 2 Bifold Doors is rated 4.3 out of 5 by 51. Rated 5 out of 5 by Rondo from I didn't need all of the parts in the kit but those I did use worked fine. Often times, the holes... I didn't need all of the parts in the kit but those I did use worked fine. Often times, the holes in the door will become enlarged from repeated use. Drill out the hole and glue in a dowel rod. Re-drill to the insert diameter size and install the insert guide.